iMedia Browser 2.0.1 is now available! We are pleased to announce that our iMedia Browser has just been updated to version 2.0.1. This free update is now available through the Mac App Store. Although this looks like a minor update, it's not. (We had considered calling it 2.1 but it was too late in the Mac App Store submission process to change our minds!) This version continues to build upon the new 2.0 architecture which we introduced in January of this year. 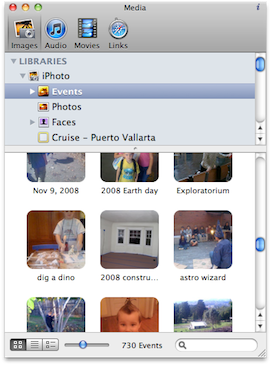 The iPhoto Browser now has full support for Faces and Events (complete with skimming previews)! This is a really great way to see your iPhoto library right alongside any app. We've also put in Faces support when browsing Aperture libraries. If you use Adobe Photoshop Lightroom 3 — or, what everybody outside Adobe just calls Lightroom — you'll be happy to know that we've added support for Lightroom's Collection Groups. Finally, we squeezed in a few usability improvements to the Flickr browser. We also don't mind saying that the iMedia Browser app wouldn't be what it is without the great community of developers who contribute to its underlying open-source framework. We would especially like to thank Jörg Jacobsen of Jacobsen Software Engineering and Sven Betzold of Ifolor AG in Switzerland for their major contributions to these recent additions to the iMedia framework. 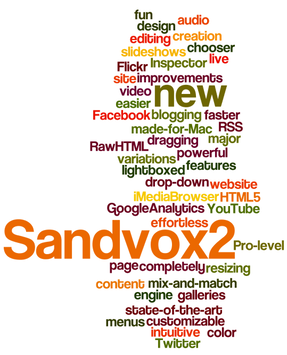 And, don't forget, all of these new features will show up automatically in Sandvox 2, set to be released next week!